Environmentalists are hailing a ban on uranium mining around the Grand Canyon. The 20 year mining ban, announced by the Obama administration, protects 1 million acres of land around the iconic gorge. The ban follows calls from Arizona officials for a mining moratorium and two temporary bans on mining claims imposed by the Department of the Interior. 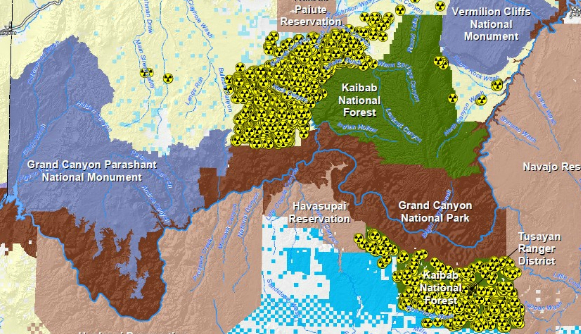 While this is indeed good start to the new year, the ban does not effect or address the some 3000 mining claims that fall outside of the million acre "buffer zone," nor the fact that 40% of the nation's uranium is mined near several Native American reservations. Map courtesy of Sierra Club.